Discover A Unique Rainforest Retreat in Coorg! Coorg in South India may be famous for its coffee plantations but you’ve been invited to wake up in Coorg and not smell the coffee! Why? 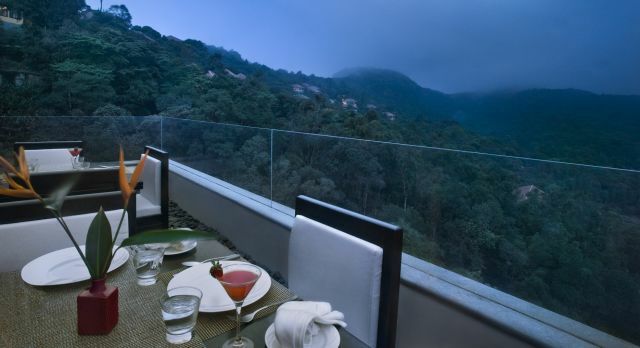 Because Vivanta by Taj has opened a unique rainforest retreat to tease you into tranquility. Situated within 180 sprawling acres of evergreen rainforest in various shades of green, the new Vivanta by Taj – Madikeri, Coorg boasts one distinct character: space. There are only 43 villas, including luxury villas and a presidential suite to guarantee each guest ample space in nature. This is the first ever rainforest resort in India by Taj and it takes up the equivalent of 450 cricket grounds. Located 4,000 feet above sea level and seven kilometers from Madikeri, the district capital of Coorg, it’s a pleasant, smooth drive from Bangalore or Mysore. Once you’ve left the city center of Bangalore, it’s a five hour drive door to door. You can also connect Coorg en route to the wonderful Bekal in Kerala. Coorg is situated in the lush green rolling hills and monsoon mists of the Western Ghats, which are truly mesmerizing. An official “Eco Hot Spot”, of which there are only eight in the world, there’s gorgeous biodiversity to observe here and the region is a bird watcher’s paradise. 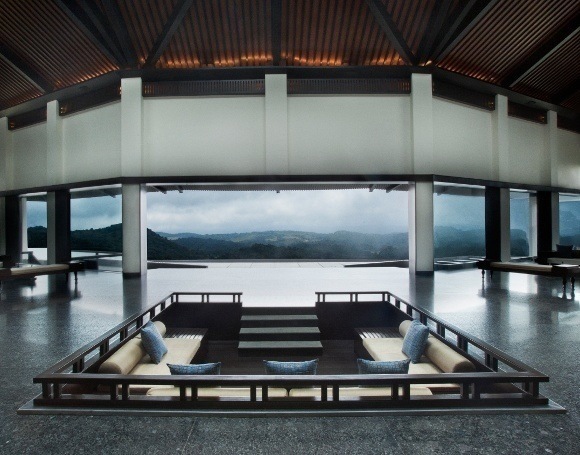 Vivanta by Taj – Madikeri, Coorg is a completely new and exciting style concept for the Vivanta by Taj brand of hotels. With completely crisp walls, injections of colors and epic glass windows overlooking breathtaking uninterrupted panoramas you’ll feel your spirit soar. 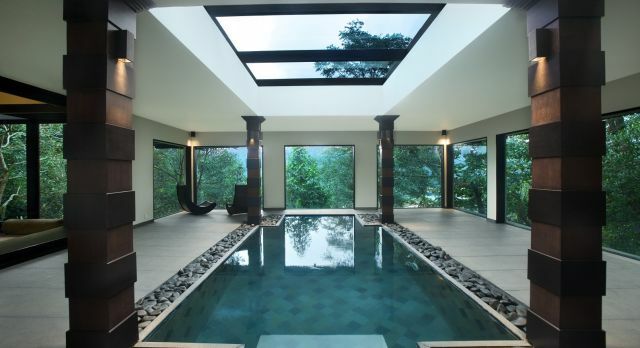 Two heated pools – including a gorgeous infinity pool – only add to the sense of harmony. Families and small groups are welcome and the villas offer adjoining rooms and suits that boast warming fireplaces, a living area and even sunken tubs where the ceiling above can open to the skies. Go stargazing and learning astronomy or spend time ruminating in the amphitheater, the conservatory or the Buddha garden. The activities are seemingly endless so you can be incredibly active if you wish to be! Children can experience a day putting up and camping out in tents. For those looking to distress, there’s an early morning yoga class, or you can unwind in the eight massive treatment rooms of the Taj signature Jiva Spa, which boasts exotic wood-fired Buddha Bath that is modeled on traditional Coorgi households. For the more adventurous, off-road biking on 26 gear bikes, high rope courses and zip lines are bound to provide entertainment. Or you can simply go hiking and trekking through nearby cardamom, coffee and pepper plantations where coffee tasting opportunities await. Golfers can get some practice in at the virtual tee-off at the resort or venture further into the Coorg region to enjoy the local golf courses. For artists there’s a fantastic potter’s studio where you can embrace hands-on arts and crafts workshops in Raku (Japanese) pottery, clay modelling, wheel work and pottery painting with various artists in residence. An organic herb and kitchen garden walk is a wonderful insight into the delicious meals you can expect at Vivanta by Taj – Madikeri, Coorg. There is both a multi-cuisine restaurant as well as a local specialty restaurant that focuses on regional wellness cuisine. You can also tuck into an al fresco meals at the Poolside Grill or quench your thirst with a tropical cocktail or two at the resort’s bar, The Hive. If a cocktail is too formal for you then enjoy some fresh toddy, the local popular brew of fermented coconut water. We offer just one word of warning: you might find it hard to tear yourself away and head back to the urban jungle! 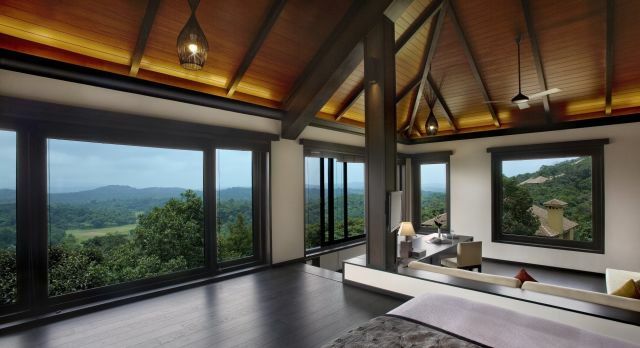 Vivanta by Taj – Madikeri, Coorg officially opened to the public on 15 December 2012. Retreat to the rainforest and embrace unique and memorable Coorg trips on your private India vacations. Click here to plan your vacation today!